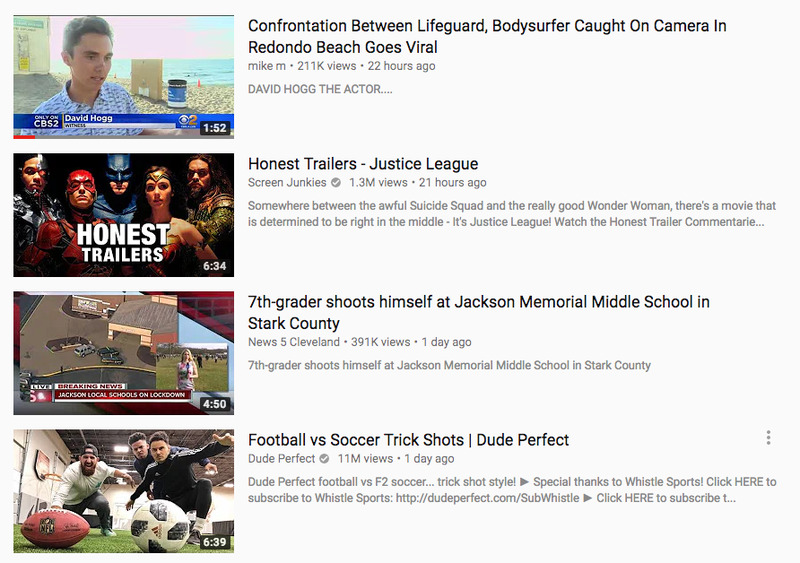 The YouTube video was first in the site’s list of trending videos Wednesday morning. It was later removed. 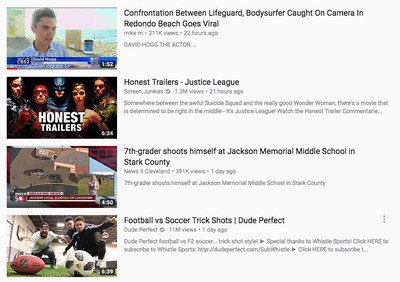 YouTube on Wednesday promoted a video claiming to show evidence that one of the survivors of last week’s school shooting in Parkland, Florida, is a paid actor. The video appeared in the top position in the site’s trending section on Wednesday morning before being removed from the section later in the morning after several news stories and tweets about it started to spread. YouTubeThe conspiracy video was at the top of YouTube’s trending chart on Wednesday. Searching for Hogg’s name on YouTube also brought up a large number of conspiracy videos as the top results. As for the conspiracy videos that were showing up in YouTube search results, a company spokeswoman sent a followup statement that said changes to the site’s search algorithm designed to promote news from authoritative sources doesn’t always work. Hogg has become a central figure in the far right’s effort to discredit the survivors of last week’s shooting as they call for tighter gun-control laws. Facebook encountered similar problems with conspiracy videos Wednesday. Hogg was one of the top topics in Facebook’s Trending module. Clicking his name brought up several videos and articles promoting the conspiracy that he’s a paid actor. A written statement from Mary deBree, Facebook’s head of content policy, which was sent to Business Insider through a spokeswoman, said the company will take down the hoax content. 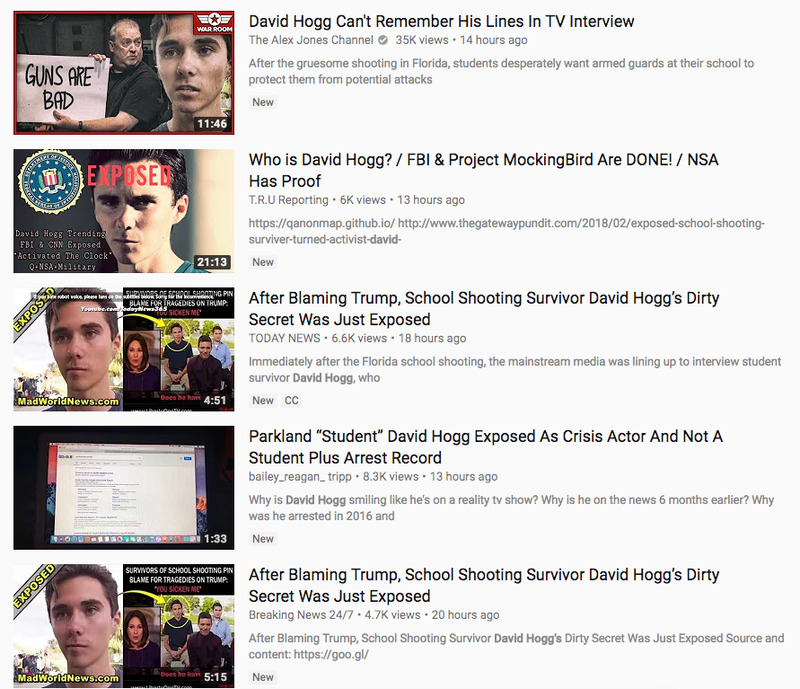 However, some of the content promoting the conspiracy theories about Hogg and his fellow students were still in the trending section as of Wednesday afternoon. 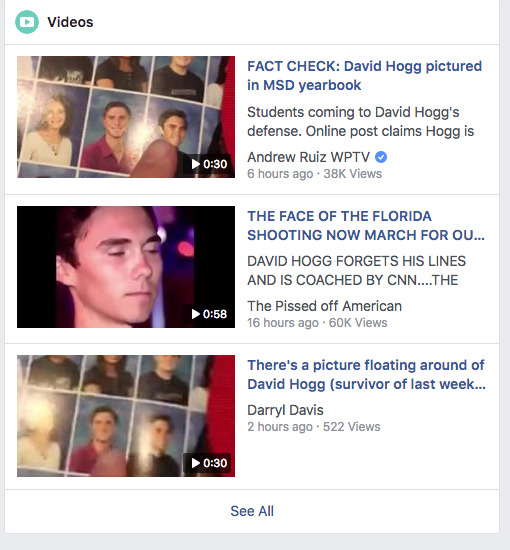 Hogg’s name disappeared from the Trending section on Facebook late in the afternoon. “Images that attack the victims of last week’s tragedy in Florida are abhorrent. We are removing this content from Facebook,” deBree said in a statement. YouTube has said it changed its search algorithms in hopes of promoting news videos from only “trusted” sources. The company has also said it plans to hire thousands of human content moderators to make sure videos comply with its policies. So far, those efforts haven’t solved the problem. Facebook has made similar promises to weed out hoaxes and fake news. The company also said it plans hire thousands of human content moderators and will start promoting content from “trusted” news sources in the News Feed. Facebook said it will ask users which news outlets they trust through surveys, but hasn’t said how it will keep users from gaming the system.